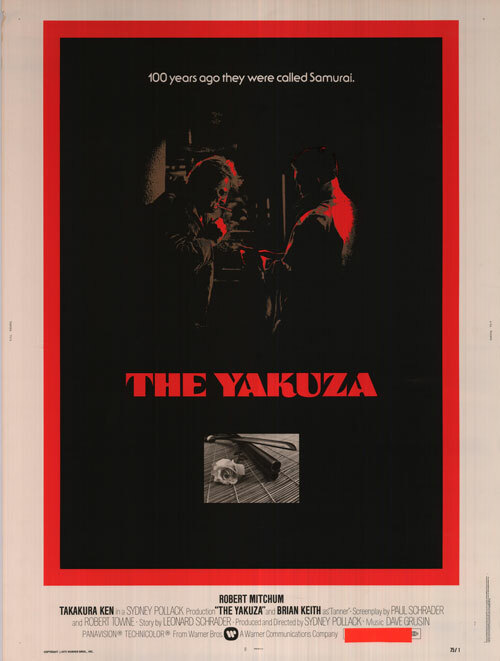 Directed by Pollack, with a script by Schrader and Towne (based on a story by Paul’s brother, Leonard Schrader), The Yakuza is a beautifully crafted ’70s noir. I don’t know how I missed it all these years. I just did. It’s in the Mitchum Signature Collection box set. It’s Pollack in his prime. It’s Schrader’s first script (he and his brother were paid the then-record amount of $325,000 for the story). Towne, fresh off Chinatown, was brought in for rewrites. However you cut it, I’d gone my whole life without seeing it until a couple of weeks ago. It was released at the end of 1974 in Japan and in March 1975 in America. 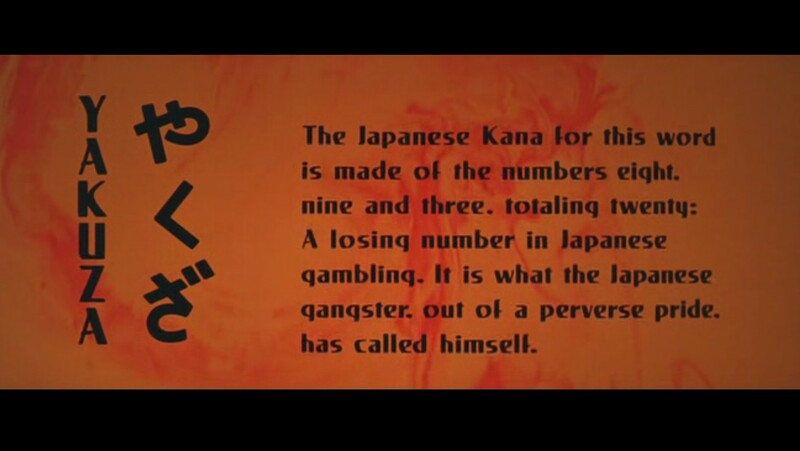 Roger Ebert cited it as “the first American version of Japan’s favorite genre, the yakuza movie.” Somehow, it wasn’t successful on its release (though it’s developed a cult following over the years, of which I’m now a happy part). 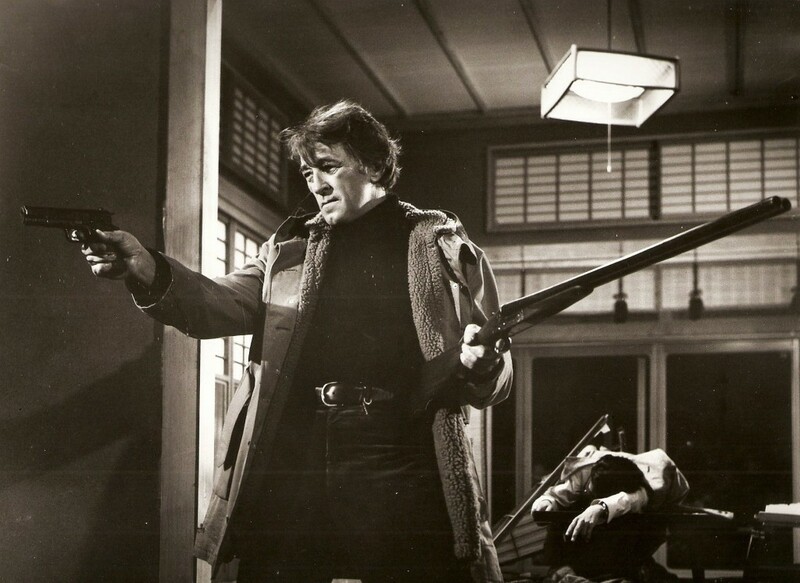 A violent picture, elegantly shot, with a tight script and one of Mitchum’s best performances, why it isn’t classed up there with Chinatown and Taxi Driver is a goddamn mystery to me. The plot’s a little convoluted at the start. Maybe that’s the reason. As I tried to explain what it was about to my wife the other day, I figured out that it wasn’t easy to talk about. So I won’t bore you with a heavy dose of plot summary. Here’s the short version: Mitchum plays retired detective Harry Kilmer, who travels to Japan to track down the daughter of an old friend and fellow Marine MP, George Tanner (Brian Keith). Tanner’s daughter and her boyfriend have been kidnapped by a yakuza gangster named Tono, who is negotiating a deal with Tanner for guns and attempting to force his hand. During the post-war occupation in Tokyo, Kilmer and Tanner were buddies. Kilmer fell in love with a Japanese woman, Eiko (Keiko Kishi), who was involved in the black market, and saved her sick daughter’s life. When Eiko’s brother, former Imperial Japanese soldier Ken (Ken Takakura), showed up (after being trapped for years on an island), he was grateful to Kilmer for saving his family but also disgusted that Eiko was shacking up with his former enemy. Ken fell away into the yakuza underworld and cut off ties with his sister. Kilmer asked to marry Eiko, but she refused and he returned to America, buying a coffeehouse in Tokyo for her with money that he borrowed from Tanner. He never took up with anyone else and always remained in love with her. Twenty five years later, Kilmer’s not only going to Japan to track down Tanner’s daughter—he’s going back for Eiko. He travels with Tanner’s bodyguard Dusty (Richard Jordan) and they stay with another old military friend named Oliver Wheat (Herb Edelman). Ken is Kilmer’s only potential connection to Tono, so he tells Eiko he needs her brother’s help and tracks him down at a kendo school in Kyoto. Ken has left behind the yakuza life, yet Kilmer asks for his assistance and Ken must go along with him because of the Japanese code of giri—Ken is forever in debt to Kilmer for saving his family. They track down Tanner’s daughter and kill two of Tono’s men in the process, catapulting Ken back into yakuza affairs. He’s intruded. He’s broken the rules. Tono arranges hits on Ken and Kilmer. Kilmer tries to square things with Ken’s brother, Goro (James Shigeta), a legal counselor to the yakuza chiefs, who also hasn’t been in touch with Ken in many years. Goro advises Kilmer that striking back at Tono is the only solution. Kilmer realizes that Tanner has taken out a contract on him as well, and the war he and Ken must fight grows to new heights. 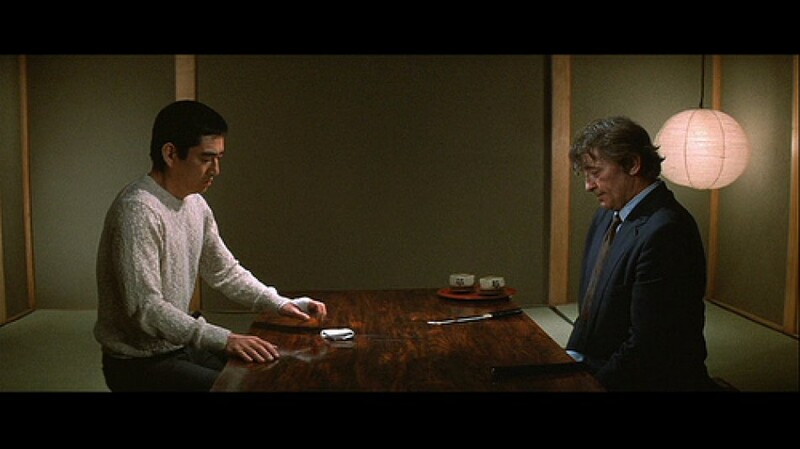 Robert Mitchum as Kilmer and Ken Takakura as Ken. If this all sounds confusing, it’s not really. It did take a second viewing for me to get down some of the picture’s backstory and to get a purchase on some of the finer points of the tangled relationship between Kilmer and Ken and Eiko. I won’t rattle on with summary, but I will tell you that the picture’s second half—which I’ve barely scraped the surface of—is flawless. Mitchum’s hangdog face, caught between his dark hair and the dark turtlenecks he seems to always be wearing, is the spark here. He’s all toughness and tenderness and swagger, and his Kilmer is the perfect noir hero, never too tragic, never too closed off. Eiko isn’t his only weakness. He has a great sense of duty and responsibility. Ultimately, that’s what The Yakuza is about. 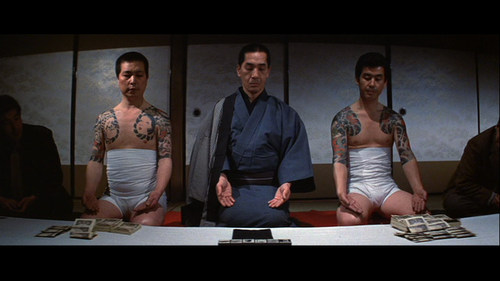 The Schrader Brothers (who, a decade later, made Mishima: A Life in Four Chaptersii) are primarily concerned with Japanese codes of loyalty and debt and forgiveness and honor and sacrifice. As the action unfolds, Kilmer realizes that he is indebted to Ken. Pollack claimed that the film was a study in contradictions. Upon first visiting Japan, he was struck by the clash between classic Japanese tradition and modern, Westernized contemporary Japan. The Schrader Brothers, clearly obsessed with this same dynamic, stress it in the script. One of the picture’s taglines—“100 years ago they were called samurai”—speaks to this notion of honor that informs the code of the yakuza, the code that Kilmer comes to know and learns to (in a way) live by. The picture is just beautiful to look at. It’s dark and moody and brutal. The violence has a certain haunted silence to it. Majestic gun fights and sword fights fill the screen. As do bright yakuza tattoos. Mitchum is otherworldly. 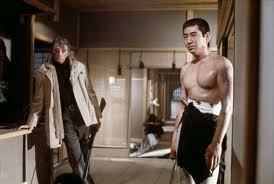 Ken Takakura’s hard stares penetrate over the distance of years. A boozy ’70s score bounces behind it all. The script was touched up by Towne, sure, but it feels fully Schrader-made, especially in the second half when the guns and katanas start flying balletically and the violence is amped up to spectacular levels. You’ll dream about this picture. You’ll dream of its soft darknesses. You’ll dream of the ways its violence spills out. You’ll dream its neon. You’ll dream its music. You’ll dream in Pollack’s tight shots. You’ll dream of Mitchum’s turtlenecks. You’ll dream of fingers being chopped off (yubitsume, it’s called). You’ll dream of bathhouse hits. You’ll dream of blood in the water. You’ll dream of ancient codes. You’ll dream of ancient sorrows. You’ll dream something about love and forgiveness. And when you’re done dreaming, you’ll wake up to your new life, the life where you let this picture rattle around in your head forever and ever amen. iRelease dates for films mentioned: The Night of the Hunter (1955); The Friends of Eddie Coyle (1973); Crossfire (1947); Out of the Past (1947); The Big Steal (1949); Farewell, My Lovely (1975); Dead Man (1995); Cape Fear (1962); Cape Fear (1991); Where Danger Lives (1950); Taxi Driver (1976); Chinatown (1974); The Last Detail (1973); Shampoo (1975); Frantic (1988); Days of Thunder (1990); Three Days of the Condor (1975); Jeremiah Johnson (1972); and They Shoot Horses, Don’t They? (1969). iiMishima: A Life in Four Chapters was released in 1985. Thank you so much for this, what i consider the best ever review of this film of many I have read. Since i first saw the picture years ago, I have pondered the concepts of honor, duty and obligation, become a student of Japanese history, and visited Japan 8 times. I too have dreamt about this film , over and over again. Though I love many great Japanese films, from Kurosawa to Mizoguchi, Ozu to Kobayashi, I keep coming back to this. This little film, made by a fine craftsman, much like the equally powerful film “The Sand Pebbles” (1966) by Robert Wise, held the spark of asian life that changed my own life forever, and i believe made me a better man. When i read your review , I felt that another felt that power i felt when i saw it. I thank you, Mr. Boyle, for giving it words.